Even if they haven’t heard the term Scramble for Africa, most people know that something went wrong when the continent was divided into nation states by European colonial powers. 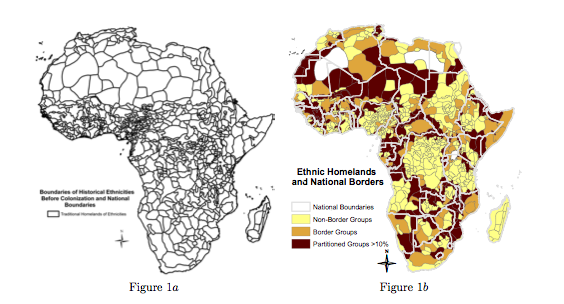 Some economists, however, have taken the time to quantify the destructive nature of Africa’s national borders. Authors Stelios Michalopoulos and Elias Papaioannou have released a new working paper showing how arbitrary border decisions have affected war and civil unrest in Africa, particularly among split ethnic groups and their neighbors. Not surprisingly, the length of a conflict and its casualty rate is 25 percent higher in areas where an ethnicity is divided by a national border as opposed to areas where ethnicities have a united homeland. Examples of divided (and conflicted) groups are the Maasai of Kenya and Tanzania, and the Anyi of Ghana and the Ivory Coast. The conflict rate is also higher for people living in areas close to ethnic-partitioned hot-spots. The uncovered differences in the probability of civil war between partitioned and non-partitioned groups becomes more dramatic when viewed in light of the fact that these two groups of ethnicities were socially, culturally and economically very similar in the eve of colonization and at the time African independence. Seems like they're saying that splitting up ethnic groups is the cause of conflict whereas I would have expected that including different ethnic groups in one arbitrarily-drawn country would be the causal mechanism. But I suppose that the two go hand-in-hand. This is very interesting and important work. Thanks for bringing it to our attention. "The arbitrary borders of an entire continent have caused untold bloodshed and misery that could have been avoided." Are there borders that aren't arbitrary? Europe, kind of the home of the nation state, has been hardly immune from ethnic conflict--including up until the present day. The Franco-German border is only stable after millions of deaths over it. Is the cultural fuzziness of the U.S.-Mexican border going to eventually lead to chaos and war? And do you honestly see many viable nation states in Murdock map? Even if borders came from within the continent more power ethnic groups would have still subjugated less powerful ones. I think there are plenty of borders that are not arbitrary. Large rivers and mountain ranges, for example, are not arbitrary borders. Someone wisely (?) said that virtually every war on earth is due to the arbitrary drawing of a line in the sand by the British. Consider that Israel felt forced to expand to "natural boundaries," since neither side could be expected to respect a line of longitude, etc. Every country and tribe DESERVES, I believe, to have borders that are guarded in some way by the natural boundaries of mountains, rivers, oceans, etc....and every sort people deserve to live TOGETHER, rather than being parted by imaginary lines and forced to live with people with whom they have trouble living. So ethnic diversity in Africa caused chaos and war? I wonder if there are wider implications for ethnic diversity elsewhere? I'm reminded of an article by Jerry Z Muller for Foreign Affairs where he argues that the peace and stability of modern Europe came about largely because the big population shifts and redrawing of borders after World War II made most European countries highly ethnically homogenous. With few dissatisfied minorities the countries could coexist in peace. I don't know if that is true or not, but it seems to be similar to this study in Africa. I'm puzzled because often the people I see blaming European colonial powers for carving Africa up into artificial multiethnic states are pro-immigration and think the same ethnic diversity in Europe will turn out fine! So is ethnic diversity and ethnic partitioning inherently destabilising? I can't imagine so, since multiethnic New World countries like US, Canada, Australia, etc seem pretty stable. So I am left unsure. Is ethnic diversity going to cause problems outside Africa too or not? One thing is multi ethniticity caused by immigration and another one is when it's caused by forced border-making. Immigration is a relatively slow process compared to what happened in Africa in the late 1800s. That was brutal, unnatural. So, multiethnic countries like US, Canada, Australia are stable; yes. But they did not suffered any kind of foreing intervention in the border-making as Africa did. So, one thing is to recieve and control immigrants through the years and another one is being forced, by countries that nothing know about African history or culture, to live together with groups that have been in conflict for centuries. Taking 50-100 different ethno-linguistic groups and push coercing them into living together is extremely different from immigration. This flows niceley with the charity article. Why donate money to Africa when the money never reaches the people who need it anyway? I think political scientists are terrified that as soon as you indicate that national borders are up for renegotiation, many parts of the world, particularly in Africa, would erupt in a tsunami of bloodshed as people tried to get their favoured borders accepted. I.e. the feeling is that however bad things are now (which isn't all that bad - much better than a few decades ago) trying to 'put it right' would be very much worse. It's interesting, but I learned this when I was getting my M.A. 10 years ago. I'm starting to get the impression that Economists just don't read papers from people in other fields. Definitely. All blame belongs on Europeans. Their greed and material gluttony brought to unnecessary divisions and displacement among the people who lived with peace. Next Post »Why Does a Caucasian Dollhouse Cost Nearly 70% More Than an African-American Dollhouse?